I bought NFL Football brand new in 1990, having walked from my dad’s place to the downtown mall one Sunday when the NFL football season was in full swing. 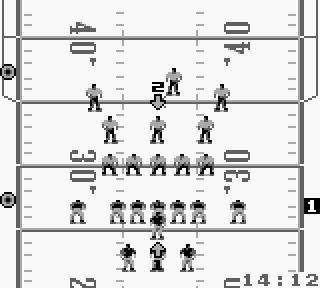 I was eager to buy the first football game released for the Game Boy, but would have been better served by getting mugged on the way there. I was an impressionable 13 year old at the time, and the sight of a helmet from every team in the league plus the official NFL logo on the box art gave me undeserved confidence in the game’s quality. NFL football has no game modes, no player rosters, and its only option is to play a short or normal game, the difference being 10 or 15 minute quarters. While you can choose any team in the league, there’s no real difference between them except for some slight speed variation. The game runs so painfully slowly though that it doesn’t really matter. You can choose between 6 offensive plays, but they’re all passing plays, so there is no option to run the ball. This is especially painful because I’m convinced that it is near impossible to not throw an interception. Your best hope is to pick a play that sends the receiver on a route straight down the field (slants, posts, etc. just make things worse) so that he only has one defender to contend with. Once you throw the ball, you’re controlling the receiver instead of the QB, so you can try to move the guy into position but its a crap shoot. Once you’re on defense (and you usually are) you have 7 defensive plays to choose from. The quarterback likes to run back and forth behind the line of scrimmage to tease you before throwing the ball up field. If you can cover the receivers well enough, he’ll hang on to it and get tackled for no gain. The graphics aren’t horrible, but the sound effects and repetitive music are. 15 minutes after I bought this game back in 1990, I would have happily traded it for Coleco’s Electronic Quarterback or some other LED-based handheld game. It would have done a much better job of giving me football on the go. Buy NFL Football on GameGavel or Amazon. Tagged 1990, Football, Game Boy, Gameboy, Konami, NFL Football, Nintendo, Review, Sports. Bookmark the permalink.